Delivering reliable, all-around performance, the Hero is designed to take riders to the next level and is the ideal user-friendly freeride board. The outline, rocker and flex have all been engineered to provide a forgiving ride and on-demand control. Its single-concave bottom shape is most pronounced in the midsection for incredible tracking while its outline blends moderately parallel rails with a progressive curve at the tips for easier edging control. 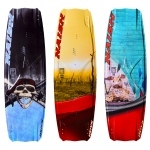 Thanks for you interest in this particular kite board. If you have any questions regarding shipping or anything else, please contact us.